Tyrone Taylor is hitting a team-best .347 in one-run ballgames this season. When the ‘Tees are in a tight game, it is usually not a shootout. Brevard County has not scored more than five runs in its one-run contests. While most of the ‘Tees struggle in these games, however, Tyrone Taylor excels. In one-run ballgames, Taylor is hitting .347, while the rest of the team has hit .185. What’s more, Taylor has been the deciding factor in two of Brevard’s six one-run games. He has contributed one game-winning run and one game-winning RBI, plus the game-tying double, heard above. Talk about unhittable, Poppe in particular has bore down when his team needs him. The right-hander has recorded three of his five saves in one-run games and has struck out seven of the 17 men he has faced. Does that sound like a lot? It should, because that mark gives Poppe a K/9 rate of 15.75 in games decided by one run. 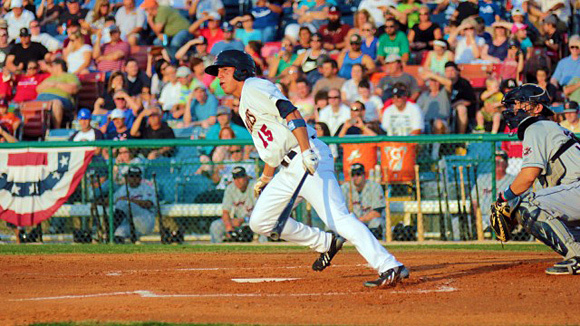 ‘Tees Tidbits: Brevard County has also faired well in three-run contests this season. The ‘Tees are 3-0 in games decided by three runs. They are 1-1 in games decided by two runs.